This week’s theme is: Guilty Pleasure? Next week’s theme: Crunch Time! YOu may notice I have two links up…I’m so sorry! Can you delete the first one? It is an old post that I’d linked somewhere else. The second link is my haiku post for this week. I’m so glad I started doing these…they are so fun! .-= Michelle aka Catholic Lady´s last blog ..Haiku Wednesday: Guilty Pleasures =-. Got mine up early…or late. Must get some sleep!! .-= Chanda @ Eco-Cheap Mom´s last blog ..Silly Haiku Wednesday – Guilty Pleasure? =-. 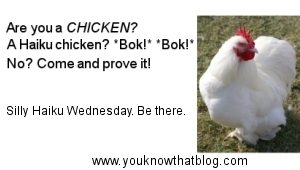 .-= Thom´s last blog ..Silly Haiku Wednesday – Guilty Pleasure? =-. Oh so mysterious! I love it! 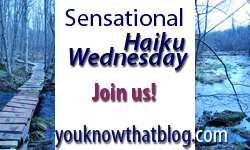 .-= Polly´s last blog ..Silly Haiku Wednesday: Guilty Pleasure =-. This one sounds like there is a co-conspirator! .-= LarryG´s last blog ..Haiku – Culprit’s mask =-. This is why we will always be friends, ShaMoo… we know too much about each other. Hehe a cryptic haiku is fun, are you ever going to explain or leave us all to wonder? .-= Jade @ No Longer 25´s last blog ..Guilty Haiku? =-. .-= Mama Zen´s last blog ..Mystery =-. I am clueless I can think if a lot of things to dance about but singing? I’ll wait to see who figures it out! Damn you…we want incriminating evidence ROFLMAO!!! .-= Melissa´s last blog ..12-16-09 Haiku =-. I am intrigued. Will we ever know? .-= Jillien´s last blog ..Haiku! (a day late) =-.